Sutton district heating scheme; embodied carbon; annual progress on decentralised energy growth in London; anticipated savings from the new GLA boiler ‘cashback’ scheme; visits by the Mayor to RE:NEW energy efficiency retrofit projects; TfL future energy costs and the Mayor’s meeting with the National Infrastructure Commission. Mayoral involvement with the Local Government Climate Roadmap; organisations operating at the London Sustainable Industries Park; potential for the London Pension Fund Authority (LPFA) to invest in low carbon London projects; whether Energy Performance Certificate or Green Deal assessments will be provided for homes that go through the RE:NEW programme; monitoring high energy consuming buildings in London; reductions in forecasted projections of CO2 savings in Mayor’s energy supply programme; Transport for London’s (TfL) Energy Strategy; the Mayor’s Memorandum of Understanding (MoU) with energy suppliers; visit by Mayor’s energy advisor to Camden’s biomethane refuelling station; correspondence with DCLG on the Mayor being able to set London specific energy efficiency targets in planning rules for new development; meetings with DECC over encouraging the use of solar PV on GLA land and building; new district heating network using heat from Greenwich Power Station; the low take up of ECO energy efficiency programme in London; connecting Whitehall District Heating Scheme to Pimlico District Heating Undertaking; the Mayor’s response to a recent London Solar Energy report by Green Party London Assembly member Jenny Jones; future TfL electricity costs; whether the Mayor responded to the Government’s recent solar PV consultation; concerns over government changes to the ECO as raised by the Mayor; funding for the next round of the RE:NEW programme; energy efficiency requirements in the private rented sector; monies received by the Green Bus Fund; work being undertaken to assess the economic impact to London as a result of climate change; attendance at the World Mayors Summit of Climate Change; planning offset funds; contract awarded for management of the RE:NEW programme; and if the Mayor’s High Level Electricity Working Group has considered solar PV. June 2014: Following an extensive evidence session on the Mayor’s domestic energy efficiency programme earlier this year – details of which are here – the Mayor has provided some additional information on work being undertaken by British Gas in London. 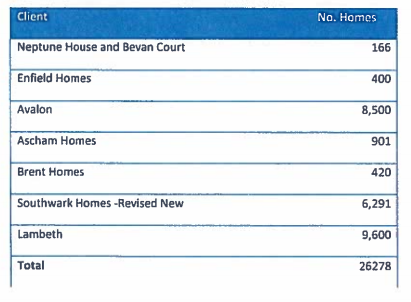 The letter states that “British Gas, with its London borough and housing association partners, has already committed to invest in excess of £36 million through eight schemes in London shown in the table below. “These schemes are expected to deliver measures to over 26,000 homes across London.” British Gas has previously stated that they would earmark specific funding to London under the Energy Company Obligation (ECO) programme: how much this level has changed following the alternations to ECO proposed by government in their recent ECO consultation is not clear, but has been raised in a recent mayoral question. 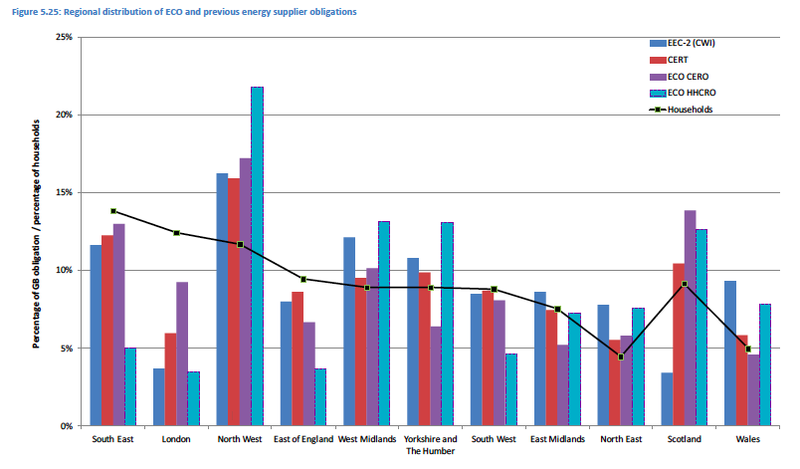 June 2014: An independent evaluation of the first year (2013) of the operation of the Energy Company Obligation (ECO), undertaken by the Centre for Sustainable Energy (CSE) for industry trade association Energy UK, has recently been published and highlights the low levels of funding directed to the capital. A summary of the report’s findings are available here. The full report is available here. Government has previously stated that the ECO would support the uptake of ‘hard to treat’ measures, which would work better for London, and hence a regional target would not be needed (see para 53 onwards from November 2011 DECC ‘Green Deal & ECO consultation document‘). It may be that DECC now needs to look at this issue again under the current ECO consultation. June 2014: The government announced a review of its ECO (Energy Company Obligation) programme in December 2013, against a backdrop of considerable media coverage, across many months, on the rising costs of consumers’ energy bills – all of which culminated in the Prime Minister’s alleged ‘cut the Green Crap‘ quote . The ECO sets a legal obligation on energy suppliers to provide a reduction in carbon emissions through supporting the uptake of energy efficiency measures in the domestic sector. Each supplier (effectively the ‘Big 6’) has a specific target assigned to it by government depending on the number of domestic gas and electricity customers they supply. The ECO is paid for through a charge on all household energy bills – which is then collected by suppliers and is in turn used by them to help subsidise energy efficiency programmes – such as reduced cost insulation measures. Each household is estimated to pay around £50 a year to pay for ECO (approximately – it depends on the level of charge passed on by the supplier to their customer to meet the costs of their ECO target), which amounts to around £1.3bn a year total ECO spend. The proposals put forward in ECO consultation, with reductions in supplier target levels, and ‘stretching out’ of the targets to March 2017 (see below), are thought to reduce the cost of ECO to households by £30-35 ie a small reduction in energy bills (around 2% against an average energy bill of £1,300) – but also an overall reduction in the amount of money going to fund the government’s main efficiency programme. It should be noted that predecessor ‘supplier obligation’ programmes have operated in the UK since the mid-90s (EESoP, EEC, CERT, CESP) and have contributed significantly to helping improve the energy efficiency of UK homes (see section 6.13 of latest DCLG English Housing Survey report here). Reduce the major sub-target of the ECO – the Carbon Emissions Reduction Obligation (CERO) – target by 33 per cent. the Mayor’s meetings with energy ministers; KPIs under the Mayor’s Climate Change Mitigation and Energy Strategy; establishing a London Energy Cooperative; ECO funding in London; the number of energy suppliers signed up to the Mayor’s MoU; the Mayor’s support for the Energy Bill Revolution’s Cold Homes Week; Kew Gardens decentralised energy scheme; London avoiding the ‘capacity crunch‘; solar installations on GLA buildings; the underheating of Londoners’ homes; the RE:NEW programme energy efficiency targets; the Mayor’s concerns over Government ‘Allowable Solutions‘ proposals; insulation industry jobs; Excess Winter Deaths; insulation projects stalled under ECO; the stalled Affinity Sutton insulation project; RE:NEW targets; retrofitting and planning restrictions; renewable energy installations on the GLA estate; GLA funding to Capita to manage the RE:NEW programme; British Gas funding to ECO; the Mayor’s High Level Electricity Working Group; LED streetlighting projects; CO2 savings achieved under RE:NEW; delayed CO2 savings under RE:NEW; the Climate Change Leaders for a Low Carbon London fuel poverty project; planning CO2 target requirements; meetings with DCLG; biofuel and London buses; GLA Environment Team budgets over next two years; Mayor’s application to the Government’s Green Deal Communities Fund; and tendering for License Lite services. 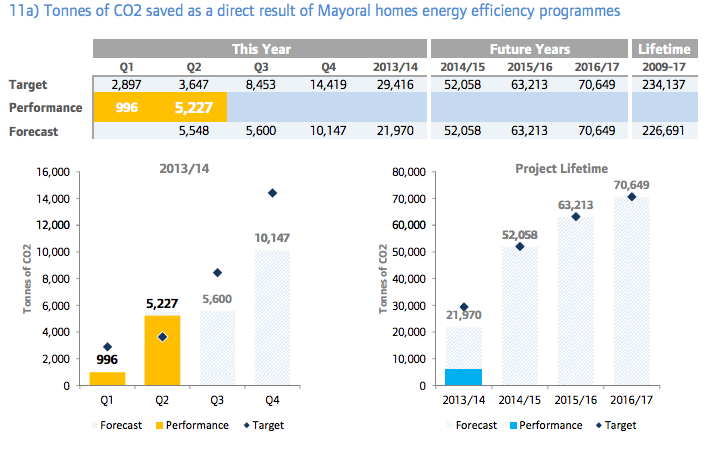 December 2013: An oral evidence session between officials and the London Assembly Budget & Performance Committee (see earlier post for details) highlighted the slow progress of the Mayor’s domestic energy efficiency retrofit programme RE:NEW. A new paper (06a(v)) presented to the 18th December meeting of the London Assembly Budget Monitoring Sub-Committee provides some data helping illustrate the extent of the shortfall. Performance payments have been withheld from contractors and the funding is being reallocated to the RE:NEW Support Team in order to reduce the shortfall in performance. However, this is not sufficient to completely mitigate the lower savings from RE:NEW Phase II and this, combined with a delay in confirmation from the European Investment Bank for ELENA funding prior to commencing procurement of the full RE:NEW Support Team, means its is forecast 75 per cent of 2013/14 carbon targets will be achieved. The targets for future years have been reviewed and updated in light of the above and as planned. They have been reduced for 2014/15 and 2015/16, but an additional year of delivery (2016/17) has been added, which leads to an increase in carbon savings overall – albeit over a longer period. LABOUR leader Ed Miliband rocked Westminster with his pledge of a 20-month freeze on energy bills. While ministers scoffed it wouldn’t work, they were stung by its popular appeal with voters. Now after two months of head-scratching, they have come up with an alternative plan to keep prices down. BECAUSE of the hard work of the British people, and because we have stuck to our long-term economic plan, Britain’s economy is now on the mend – and we’re determined to help families in every way we can. The Coalition is offering real help in these hard times: income tax cuts, a council tax freeze, a fuel duty freeze and free school meals for young children. We have only been able to do this because we have taken difficult decisions and our economic plan is working. This week, we will announce further help: proposals that will be worth around £50 on average to energy bill-payers. We’re doing it without taking any help away from poor families or sacrificing our green commitments; and in a way that will keep Britain’s lights on in the long-term too. When you look at your bill you see it is made up of various costs. Some of these we can’t control. Most of what you pay is determined by the price of energy in the global market – the gas and oil we’re buying from the Middle East or Europe. Politicians in the UK cannot wave a magic wand over these prices. To pretend you can is fantasy politics. But there are bits that government can control – the parts of your bill that go to helping the poorest families heat their homes and to making Britain more energy efficient. Some say we should drop these commitments entirely but we do not agree. As we approach winter, we refuse to turn our backs on the worst-off families. And if we abandon our green commitments, it is our children and grandchildren who will pay the price. This Coalition Government has never pursued quick fixes today when they’ll hurt people tomorrow – and we’re not going to start now. So we are going to stick to these commitments but we are not going to ask you to pay for all of them through your bills. The two million poorest families who currently receive a discount on gas and electricity will continue to do so, but Government will pay for it. We’re able to afford this because we have cracked down on tax avoidance – leaving us more money to help struggling families. We are also changing the way we fund improving energy efficiency in Britain’s homes. We will all be better off when our homes lose less heat, so we want the energy companies to help insulate as many homes as possible over the next decade. But – apart from in the worst-off homes – we’re going to spread the costs of these programmes over a longer time frame, reducing people’s bills. And to make sure we carry on cutting enough carbon, the Government will pay for new incentives for people to insulate their homes. Alongside the Green Deal, when you buy a new home you could get up to £1,000 from Government to spend on energy-saving measures – equivalent to half the stamp duty on the average house – or even more for particularly expensive measures. It is an all-round win. Better insulation means cheaper bills, it will cut carbon emissions and boost British businesses who provide these services. On top of that, we will offer cash incentives to landlords of the least energy-efficient properties so that, when they are between tenants, they can better insulate their properties. And we’ll also make sure our schools and hospitals are more energyefficient, too. Taken together, these things mean we will meet our green commitments and support those employed in the insulation industry but, crucially, without putting the cost on energy customers. Labour have promised a temporary price freeze on energy bills. But they’re taking people for fools. Energy companies would hike up prices both before and after the freeze – so families would end up paying more. Not only that, by cutting investment in green energy, their freeze would threaten thousands of jobs. Labour’s con is the worst of all worlds. When an offer sounds too good to be true it usually is. The Coalition has come up with a serious and credible plan that actually works. By taking the time to get this right, we’ve got the best outcome all round. No poor family will lose a penny of help. Our clean energy sector will get the investment it needs, the lights will stay on and we will cut just as much carbon as we planned. Instead of a fake giveaway, we’ve found another way to support Britain’s hard-pressed families when they need it most.